Lemon Inkwell: Countdown to Launch! 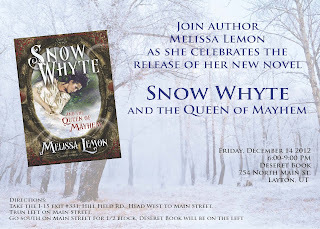 I am so excited for the release of Snow Whyte and the Queen of Mayhem! I hope lots of you will join me for the launch party where I will sign books, dance like a chicken and serve snowflake cookies (if I can find out where to get them). To kickoff the countdown, I am giving away 2 copies to one lucky winner. One for you to keep and one for you to give away. The contest runs until the 14th. To enter, simply leave a comment sharing who you will give the extra copy to. For extra entries, tweet or post on facebook about the countdown during the next 2 weeks. Please include my twitter name (Melissa_Lemon) or facebook name (Melissa Lemon) so I can keep track of your entries. Watch for character introductions and insights into Snow Whyte and the Queen of Mayhem. Hi Melissa! I will give the other copy to Suzie because she kind of reminds me of Snow White. Or maybe she reminds me more of the Queen of Mayhem. I would give the extra copy to the woman I LOVE!! Oh wait... She is the one who wrote the book!! Guess I better be disqualified. :) Love you Dear!! Good job on your second book. I would give the extra copy to my daughter, because I know she'll love your great fairy-tale! I would give the extra copy to a fellow bookseller who loves fairy tales as much as I do because her nickname is also Kat, which makes it extra-special! If I win I would give it to my friend Chris who loves to read and she liked reading Cinder and Ella! If I won, I would probably give the other copy to one of my friends, who also loves to read (especially twists on fairy tales)! I would give it to my Daughter who wants to be a writer, she is writing a book right now, which started from a dream she had. I can never seem to get enough novels for her to read, i can't keep up with her! I'd be so thrilled to own a copy of this book. The other copy I'd give to my sons' homeschool book club for all the kids to read.